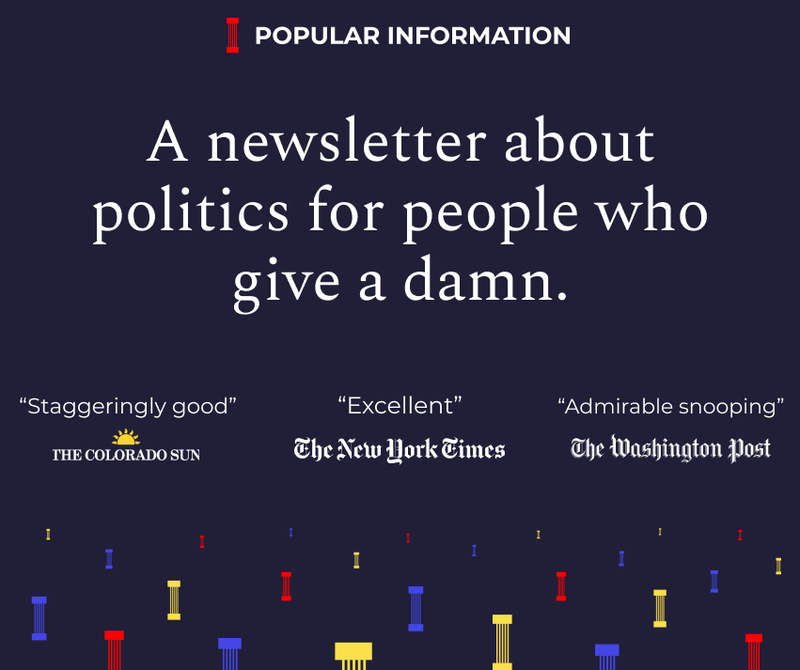 If you’ve been forwarded this newsletter, sign up at popular.info. The latest evidence came Monday when The Daily Beast reported that White House counsel Don McGahn waived federal ethics laws so that Communications Director Bill Shine can speak freely with Fox News executives. Shine came to the White House last month after being forced out of his top role at Fox News for covering up allegations of sexual harassment. Federal law prohibits most professional communications by federal employees with their former employer for at least a year. The provision is designed to prevent a revolving door where company employees are installed in government and then perform favors for their former employers. McGahn’s memo neatly summarizes the Trump administration’s posture toward Fox News. Its relationship with the network “outweighs” integrity. Shine was given the role of White House Communications Director on the recommendation of Sean Hannity, who hosts America’s most popular TV news broadcast. The New York Times reported that Shine is expected “to serve as an extension of Mr. Hannity” in the White House. Hannity no longer pretends to be a journalist or even a commentator. His program is devoted to glorifying Trump and demonizing his enemies by whatever means necessary. During their calls, Trump and Hannity “discuss ideas for Hannity’s show, Trump’s frustration with the ongoing special counsel probe and even, at times, what the president should tweet,” according to a report in the Washington Post. Thank you @foxandfriends. Really great job and show! Trump doesn’t just watch the show, according to White House aides; he uses it to set the rest of the day’s agenda. “He comes down for the day, and whatever he saw on 'Fox and Friends,' he schedules meetings based on that. If it’s Iran, it’s ‘Get John Bolton down here!’” a former White House official told Politico. Fox News is a propaganda network for the Trump administration and dominates the TV ratings, but the playing field is leveled online, right? Fox News gets the most distribution on Facebook of any publisher, according to data from Newswhip. Facebook is also paying Fox News to produce 12 shows a week for its new platform Facebook Watch. Fox News represents an unprecedented development in American politics. An entire television station, with an established audience of millions, has devoted itself to the glorification of one man: Donald Trump. Ordinarily, state-run propaganda needs to be subsidized by the government. Fox News has found corporations willing support this content with advertising dollars. Occasionally, corporations flee Fox News when one of their hosts mocks a mass shooting survivor, dabbles in an unhinged murder conspiracy or is accused of serial sexual harassment. But no one seems to mind subsidizing government propaganda. The network plays an indispensable role in creating an alternate reality for Trump supporters. It appears to be working. No matter what Trump says or does, his support from about 40% of voters, including nearly all Republicans, never waivers. If you watch Hannity, it makes sense. In the world he and Trump have created, everything is going great. Omarosa Manigault, the former Trump aide with a new tell-all book, was fired in December 2017. In an interview Monday, Manigault alleged that Trump had “some serious mental impairment,” which she blamed on his Diet Coke habit. At the time of her firing, she was Trump’s most prominent black adviser. Which raises the question: who is the highest-ranking African American left in the West Wing? Trump adviser Kellyanne Conway was asked this question on Sunday. She eventually named “Ja’Ron,” apparently unable to remember his last name. She was likely referring to Ja’Ron Smith who is a mid-level aide working on urban affairs. He does not have an office in the West Wing. The Washington Post, using slightly different criteria, identified 4,229 “false or misleading” statements during Trump’s first 557 days. That works out to 7.6 questionable claims for each day Trump has been in office. According to the Post’s analysis, Trump is getting less accurate over time. During his first 100 days, he averaged 4.9 “false or misleading” statements every 24 hours. In June and July, Trump averaged 16 “false or misleading” statements each day. On July 5 alone, Trump made 79 “false or misleading” claims -- about one every 9 minutes.